Police arrested a college student Tuesday suspected of opening fire at an apartment during a dispute over a video game console, killing one man and wounding two others. Jonquel Brooks, 19, was taken into custody after a series of intense phone negotiations with police, his parents and an attorney, Fresno Police Chief Jerry Dyer said. Police said the shooting across a street from Fresno State University's stadium broke out during a confrontation with four men over a PlayStation game console late Monday. Brooks, who was majoring in criminology at Fresno State, was arrested after police and federal agents launched a manhunt for him. Investigators initially believed he was still inside the apartment complex where the shooting occurred, but then expanded the search to other parts of Fresno. "The suspect had altered his appearance significantly," Dyer said. "He shaved his head and also changed his clothing apparently in an attempt to avoid being recognized." The Fresno County Coroner's Office identified the deceased victim as a Brant Daniels, 19, who had moved from the Los Angeles area to attend Fresno State but was not a current student. Police identified the two wounded men as Fresno State student Roderick Buycks, 19, and Drew Pfeiff, 22, who is not enrolled at the university. "The guy who shot us — he had stolen from our apartment. We went to confront him with the evidence and it just turned ugly from there. 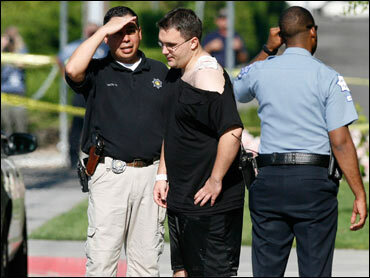 He pulled a gun out on us," said Pfeiff. Brooks fired five or six times, grazing Pfeiff, he said. "People don't deserve to die for stupid stuff like this," Pfeiff said. Fresno State freshman Meosha Chase, 19, said she was Brooks' ex-girlfriend and described him as a "fine, normal, goofy, silly" teen who wanted to be a parole officer. Residents of the apartment complex were evacuated to the campus cafeteria. The campus, which has about 20,000 students, remained open, said Tom Uribe, a university spokesman. "We were assured by the police that the campus was safe, and we're waiting to hear more," he said. Fresno State students were never in danger because police were in contact with the gunman and knew he was not on campus, Dyer said. Police were searching for evidence, including the gun, at six apartments at University Village Apartments. "This is not another Virginia Tech," police spokesman Jeff Cardinale said, in reference to last month's university shooting in which 33 people died, including the gunman. "This is simply a dispute between one person and a group of individuals."